Reuben “Tihi” Hayslett’s Dark Corners collection of short stories explores the lesser visited experiences of those within the LBGTQ communities. 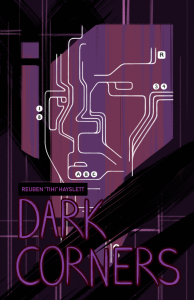 LOS ANGELES, CA, USA, March 17, 2019 /EINPresswire.com/ -- Reuben “Tihi” Hayslett’s Dark Corners collection of short stories published by Running Wild Press, explores the lesser visited experiences of those within the LBGTQ communities. “The stories in this collection, written before and during the 2016 election, function as a kind of lodestar. They are not explicitly political, but politics hover unmistakeably in and through all of them. They are not realist, but realism pervades even their most magical elements. This is their abiding strength.” -- Asam Ahmad, editor. Wholesale at 55% of retail pricing. The ebook and paperback are available for pre-order and will be available wherever books are sold on March 31, 2019. Running Wild Press finds writing that illuminates our collective imagination, polishes it, and then shares it with readers. Want to know more about the stories, the author, and the press?